I was recently given the opportunity to try some new skincare products. Because new items introduced to any skincare routine can take 30 to 90 days to show it's full effect, my plan with this review is to give you my first impressions on the products I've used and any effects I received within 30 days of using the products mentioned here. 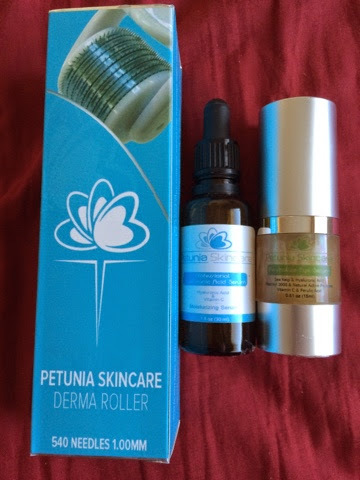 This first impressions review is about three products from Petunia SkinCare; the 1.0mm DermaRoller, the Revitalize Eye Serum, and the Professional Hyaluronic Acid Serum. I chose to use these three items together once a week for four weeks, and also used both serums daily. The dermaroller is to be used on clean skin with clean hands and should be sanitized before and after use. When rolled on the skin it punctures the skin causing increased forced repair and renewal, as well as increased absorption of serums. I found the eye serum to work extremely well, and not causing milia like richer creams often do to my skin. It has quickly become a favorite of mine. The serum is a fairly standard hyaluronic acid serum which has a low enough pH to not disrupt the skins acid mantle, but not low enough to cause chemical exfoliation. When used with the dermaroller it absorbs almost immediately and improves my skins clarity overnight. I highly recommend this skincare trio for all skin types. You can find these items on Amazon if you'd like to try them for yourself!